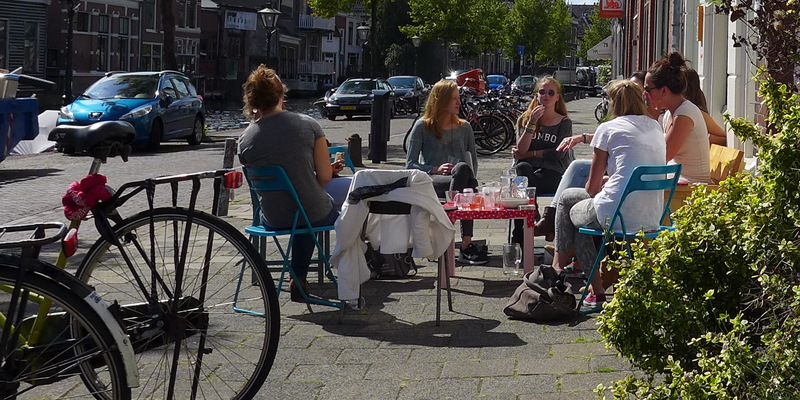 Three days after Tootie returned from our weeklong trip to the Netherlands, she told a friend “That was the best vacation I have ever had.” We had spent a week cycling around the countryside and cities south of Amsterdam. We flew to Amsterdam Schiphol Airport taking our own bicycles with us. I had my folding PBW Bike that fits in a suitcase; Tootie and I had put her conventional bike in a bicycle box. American Airlines took mercy on us, and did not charge the expected $ 150.00 each way for the bicycle. We landed in Schiphol on a Wednesday at 2:00 PM. I had made reservations at the Sheraton Airport six days later, the night before our return departure. Because of that reservation, we could leave the box and my bicycle suitcase at the Sheraton, which is within the airport terminal. On arrival, Tootie and I picked a spot in the terminal, put the bicycles together, and dropped off the cases at the Sheraton. We then cycled off from the airport into the countryside. We carried our small amount of luggage on racks on the bikes. We did not have to take any public transport the whole week, not even an airport bus. Not having to take public transport, especially with a bicycle, certainly reduces the stress level. 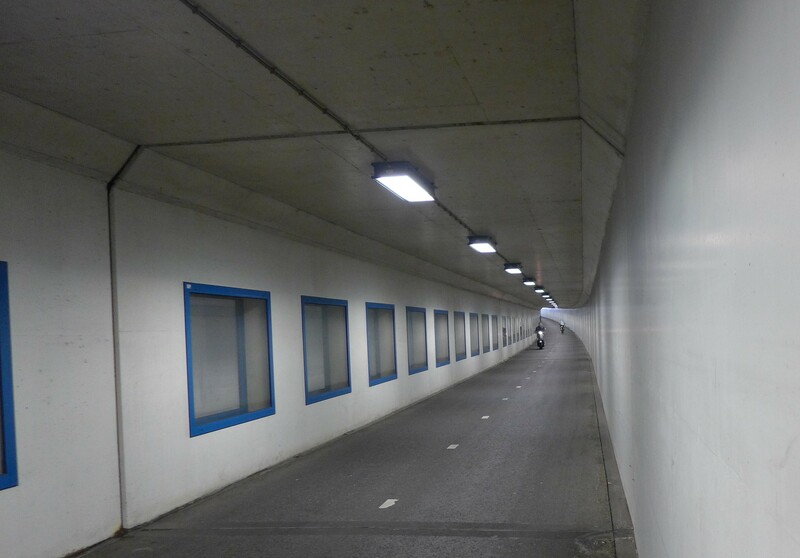 The bicycle path leaving the Amsterdam airport is so complete that it even has a separate tunnel under the runway. 1. The weather is such that special clothing is almost never required to ride a bicycle. We were there in August, and most cyclists were wearing a second layer for warmth, like a jacket. Getting sweaty and having to change clothes or shower on arrival is essentially unknown. 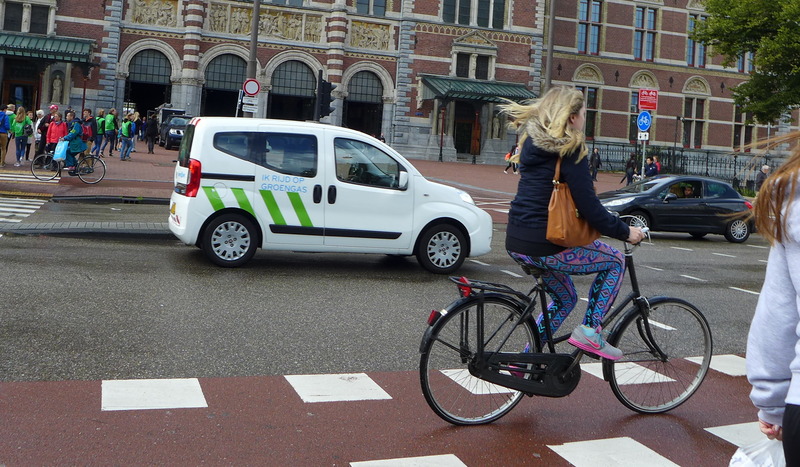 Most people would not put on athletic clothing to bicycle in the Netherlands any more than you would do so to drive a car. The only bicycle helmets we saw were with guys in spandex suits, training on racing bikes. Everyone else just wore their regular clothes. It does rain a lot in the Netherlands, but this frequently involves extended periods of gentle drizzle. Most Dutch seemed to just get wet. 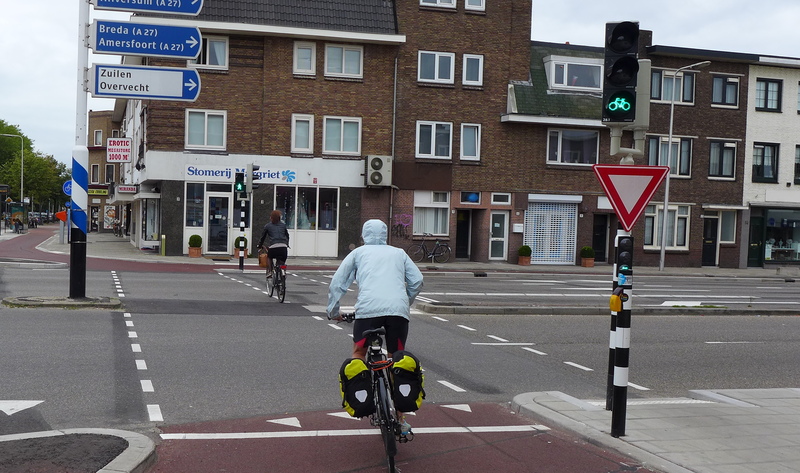 Cycling in the rain in the Netherlands is no worse than walking in the rain. We saw people cycling holding an umbrella. 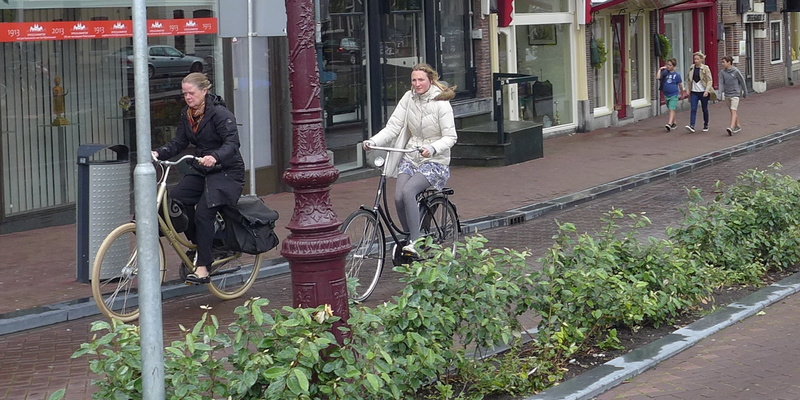 Almost all bicycles in the Netherlands have fenders to keep from getting splashed, and have covered chain rings to keep pants away from the chain. 2. The vast majority of the country has no hills; much of it built on former swampland. The biggest hills we climbed all week were a few overpasses, and one sand dune near The Hague. 3. The country in very densely populated, and things are very close together. We cycled to most of the major cities in the country in an area not that much bigger than the Raleigh / Durham area. Because of strict land use controls, there are sheep grazing in open fields less than seven miles from downtown Amsterdam. 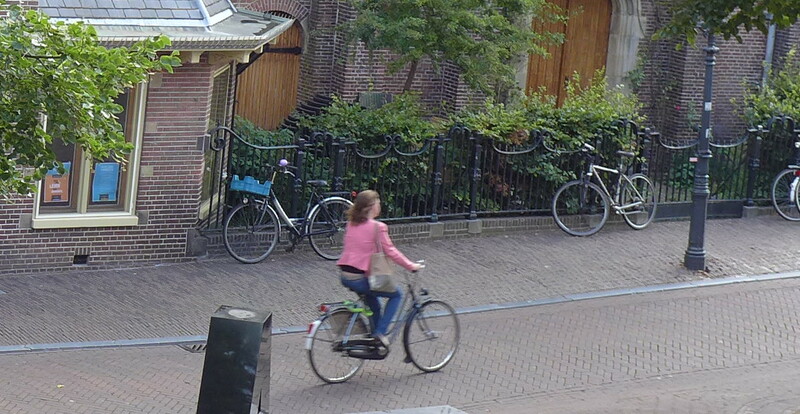 I do surmise that many of the bicyclists in the Netherlands are traveling very short distances. Riding to the train station seems a common journey. 4. The country has made a decision to encourage bicycling, and has a complete network of trails, paths, and bicycle lanes. Things are clearly marked, and there are generally separate red lights for bicycles. The bicyclist almost never has to make a decision where to avoid traffic, and a bicyclist almost always feels safe. I did not drive a car there, but it seems like bicycling is much lower stress than driving. There really is a culture that puts bicycles first. The United Kingdom has similar geography and weather, but cycling in London is very different than cycling in Amsterdam. I looked up “I hate bicyclists” on YouTube, and many of the videos were not in the expected rural USA, but in England. There are scenes of fistfights in England between drivers and and bicyclists. While I have cycled in the U.K., and it can be quite pleasant; in the U.K., as in the USA, to bicycle you must engage in a war. 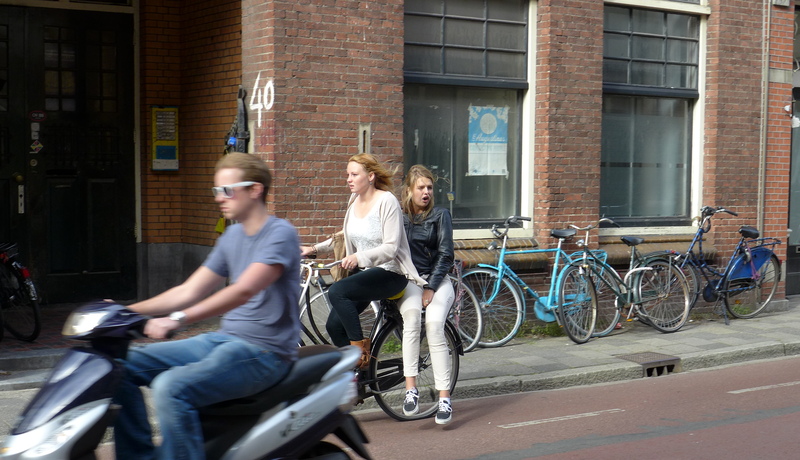 In the Netherlands, bicycling feels so relaxed it is almost zen-like. A note about language. 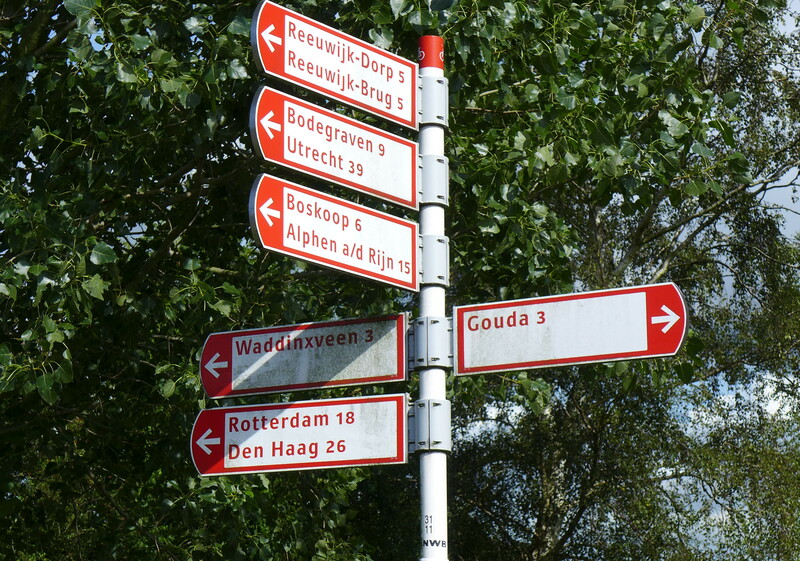 Other than Montreal, Holland is the only place I know where the language is not English, but you can brazenly assume everyone speaks English. People answer you in English, and no one we saw seemed to take offense. In fact, the Dutch were overall very helpful and friendly. That first afternoon leaving the airport, we bicycled off towards Haarlem, We had googled earlier “ten prettiest towns in the Netherlands.” Haarlem, fifteen kilometers from the airport, was on this list. We arrived in downtown Haarlem around six at night, and looked around for a hotel. Not only had we not made hotel reservations for the week (other than the final night at the airport Sheraton) but our loaner Verizon-for-Europe cellphone refused to work. We just had to find a hotel every night the old fashioned way, by asking and looking around. Interestingly, it was never a problem, or even difficult. That first night we stayed in a great hotel overlooking a medieval church right in the center of Haarlem, and had a nice dinner at a restaurant nearby. 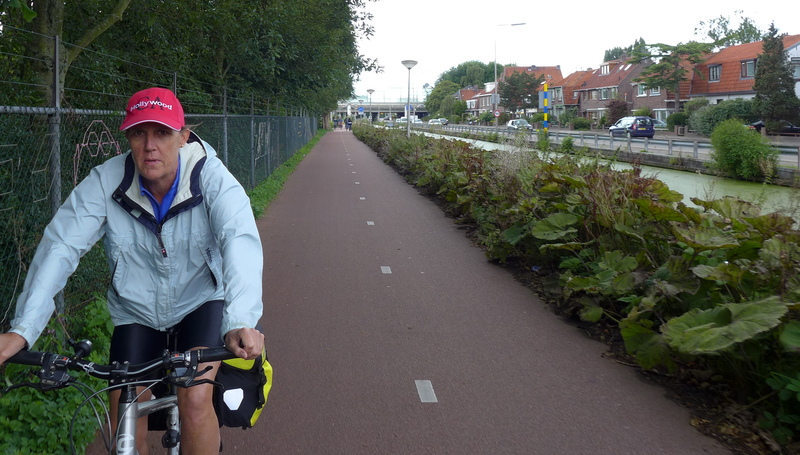 Over the next few days we cycled a big loop around central and south Netherlands. After cycling on Thursday through tulip fields, our second night was Leiden. Population about fifty thousand, it is a big college town. Bicycle traffic downtown was denser than even in Amsterdam. 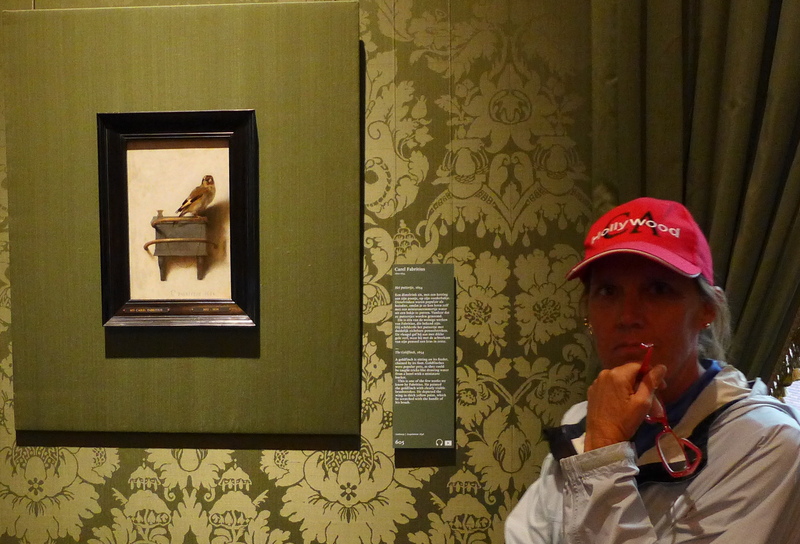 The next day we stopped for lunch in Den Haag (The Hague) and saw the painting The Goldfinch that inspired the novel of the same name. Friday night was in Gouda, as in the cheese. Saturday night was in Utrecht, as in the treaty of. Both are wonderful historic cities laced with canals. Sunday we rode mostly in the rain from Utrecht to downtown Amsterdam, where we stayed one night. As long as we kept moving, we did not get too cold, and hurried to dry off in our hotel, which we had booked the night before. Monday we walked by the Anne Frank house, went to the modern art museum, and did some shopping. While Tootie was inside some stores, I walked around photographing bicyclists. Later that afternoon, we bicycled out to the airport.